It is often challenging for parents to communicate with their children. Children and teens can have feelings and emotional problems just like adults, ranging from childhood stress, eating disorders, self-harming behaviors, challenges related to parents' divorce, death, or problems at school. 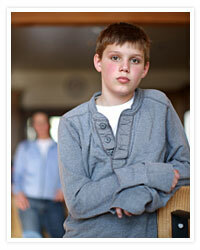 Several members of our team of professionals specialize in dealing with children and teenagers. They can help your child to positively cope with the many challenges they face. Therapy allows your child to gain improved coping skills and helps you to understand your child's behavior and respond more effectively. By helping you heal the parent/child relationship we can enhance positive treatment outcomes. Call our office to schedule an appointment. Medication is often required to manage psychological conditions, such as depression, anxiety, ADHD, and more. For many circumstances, therapy and medication is often a powerful combination. Our staff CRNP will work with you to determine whether or not you would benefit from medication, and what medication would best suit your needs.